For a long time, I've been on the quest to find the perfect base coat. No matter how hard I tried, how far I searched, I just couldn't seem to find the one that made my polish last. That is, until I came across CND Stickey Base Coat. My best friend had been singing Stickey's praises for years -- not to mention it's used backstage at almost every fashion show during New York Fashion Week -- but for some reason, I never tried it. Finally, though, the curiosity became too great and I simply had to have my own bottle ... so I traversed to Ricky's (not so hard, since I live across the street) and picked one up. Oh. My. God. My life has been changed forever. My nail polish literally lasts for weeks now without chipping -- we're talking at least 10 days of chip-free, smooth, long-lasting polish. Not to mention that no matter how dark the polish is, my nails are never stained orange or yellow. My verdict? I'm never polishing my nails without this base coat again. 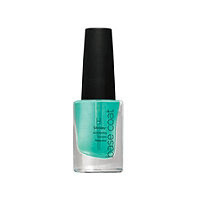 CND Stickey Base Coat retails for $8.50 at ulta.com. I too have been on the hunt and was even told by a manicurist that it was impossible. Will try!